The seniors on the Cougars’ roster celebrate after being awarded the 2017 3A state trophy. Winning a state championship is no easy task. Coming back to do it again can be even tougher, as being a defending state champion carries a large target on your back. 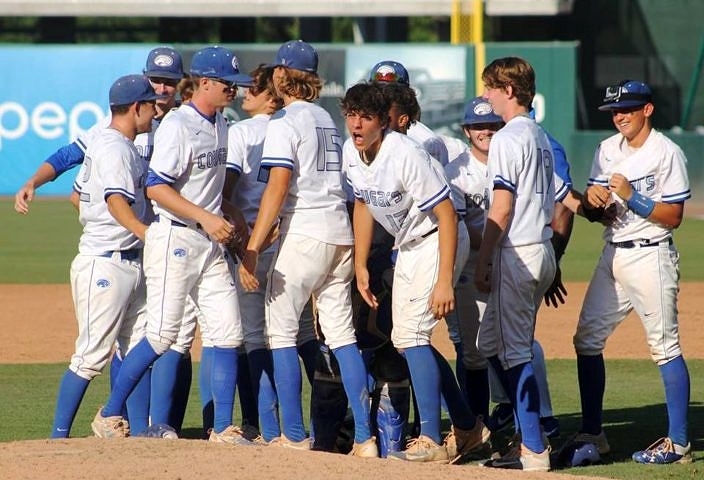 But that was exactly what the Canterbury Cougars accomplished this season, as the team earned a 4-1 win over University Christian in Saturday’s 3A state championship at Hammond Stadium in Fort Myers. Senior Cooper Swanson made his final high school game something to never forget, as the senior tossed the one and only complete-game of his entire baseball life. The right-hander locked in to a pitcher’s duel with the Christians’ Alejandro Visaez, who also went the distance. Swanson only allowed one unearned run while his offense strung together enough support to make the Cougars champions once again. Each season is a new group with its own identity. Even though the team has won two straight and the perception may be that it is the same team, the 2017 squad was strengthened more on hitting and scoring runs. Even with a deep arsenal of arms, the approach was to put pressure on the opposition early and often. That approach was put to work right away on Saturday, as Canterbury drew first blood in the bottom of the first inning. Cooper Swanson lined a single up the middle and just past the diving second baseman, and courtesy-runner Nick Vanderhof came onto the base paths and quickly stole second. Sam Keating followed with a base knock to right field for runners on the corners and Tyler Shuck drove Vanderhof home with a sac-fly RBI on a shot deep to center field. Canterbury’s Cooper Swanson pitched the first complete-game of his life in his final high school action. Swanson got the Cougars going again in the third, as he started off the frame with a base hit to center and advanced into scoring position thanks to a sacrifice bunt from Giovanni DiGiacomo. Nick Vanderhof came in again to run for Swanson, and quickly raced around third to score off a throwing error following a single past the second baseman from Keating. Keating advanced to second on the miscue, stole third and came home on an RBI single from Tyler Shuck. DiGiacomo had been called upon to bunt a bit lately, with Swanson doing his part in getting on base from the leadoff role. He had started to take it as a punishment, but then began to accept that it was part of his job. Executing fundamentals has been a focus all season offensively, and the players see the success that leads to. The Christians (20-9) responded to get on the scoreboard in the top of the fourth. Starting pitcher Alejandro Visaez dropped a double into shallow center field, and gave way to courtesy-runner Kyle LaCross. Dylan Richman then connected for an infield chopper that allowed LaCross to round third and score to make it a 3-1 deficit. Canterbury added one last run to inch ahead in the fifth. Swanson was hit by a pitch and then stole second, where Vanderhof again came in to run for him. DiGiacomo then dropped down a great bunt that went for base hit since the third baseman was playing back. Keating then reached on an error that loaded the bases and Giovanny Lorenzo reached off another error that plated the final run. 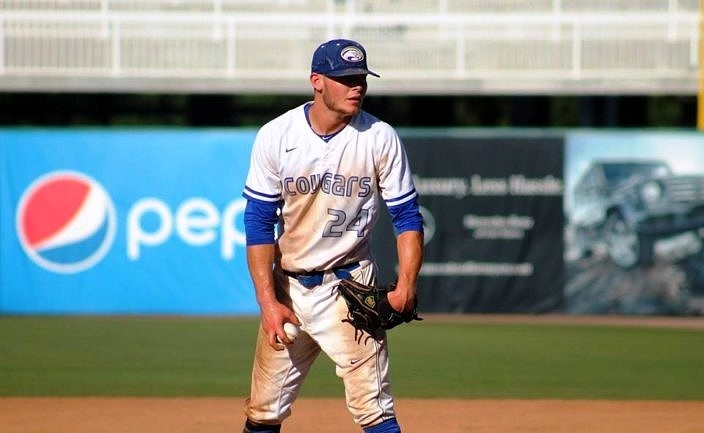 With a talented team that boasts five players that will go on to play college baseball, managing the talents and personalities can be a challenge. But thankfully the Cougars had the right captain leading the team in senior Donovan Duvall. Sometimes Duvall was even tougher on the players than the coaches, pushing them all to be accountable. For the character and work ethic he showed all season, the players agreed that they made the right choice in choosing a leader that had all the things it took. “With all of these going on to play Division I baseball, for them to want me to be the leader of their team, it really meant a lot to me,” Duvall said. The players all grew up competing together, including the seven seniors on the team that played their final game together. Swanson even joked how he and Duvall were enemies competing on opposing teams for years, before they became Cougar teammates. The Canterbury Cougars repeat as 3A state champions, 4-1 over University Christian. And now it is time for Canterbury to celebrate.